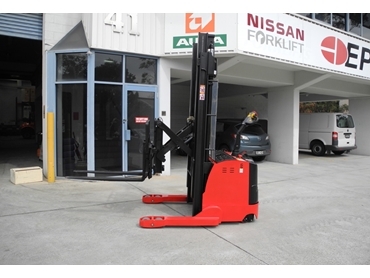 Lencrow Group announces new models in its Easy Reach range of pedestrian walkie reach trucks. Now available in two sizes and more lift heights, the Easy Reach range has added a 2000kg model to the existing 1500kg unit, with power steering as standard and options of masts to 6000mm, and optional side shift if required. Lencrow’s Easy Reach range of reach trucks offers superior reliability with the use of AC traction for drive with the very reliable Curtis controller. This system gives smooth throttle operation and infinite control. The hydraulics are DC control and come with options of manual or tiller control. Ross Grassick, Managing Director of Lencrow Materials Handling explains that the Easy Reach units have been imported for the past two years and the company is now getting repeat business due to customer endorsement. Their buyers have however sought improved capacity and higher lift heights, which are being provided by Lencrow along with custom build options. Mast heights above 4500mm feature a three-stage design, and standard units in these heights have side shift as standard. An automatic battery charger keeps the battery in top condition and is separate from the unit for better reliability. Key benefits also include an ergonomically designed handle to give the operator control of the unit as well as good visibility of the load in addition to a full range of safety features to comply with current WHS requirements. All Easy Reach pedestrian walkie reach trucks are supported with Australia wide service and spare parts from Lencrow Materials Handling.